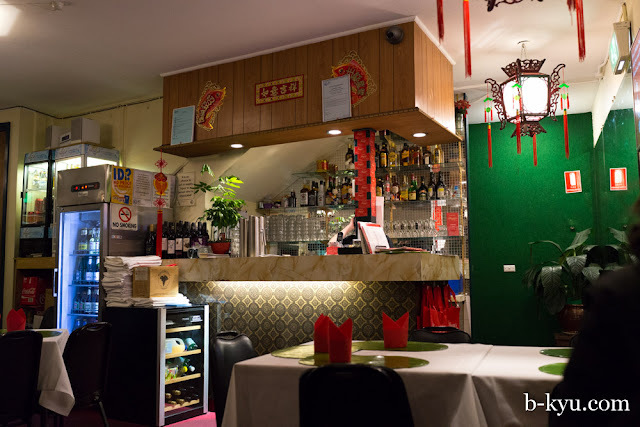 Salt, pepper and Tsingtao at Happy's Restaurant, a Canberra eating institution feeding our nation's leaders since 1962. 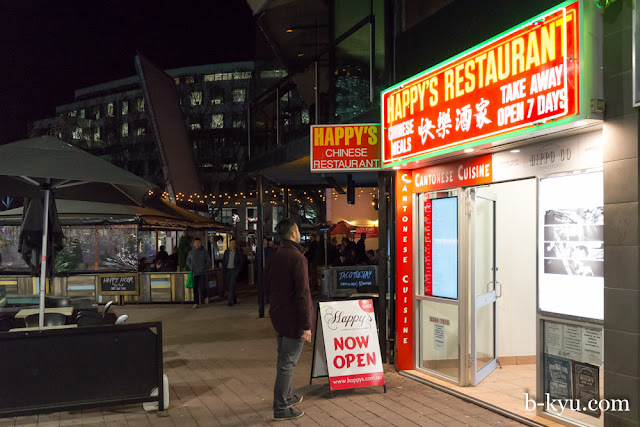 Happy's Restaurant is in Garema Place, Civic. This strange brick pavement arcade in the centre of Civic hasn't changed much in the many years since DAAS busked there, though the drug selling ferals seem to have shifted on. While there's a few new hipster style joints, Happy's still just looks so gloriously daggy, so old school Strayan. We just had to go in. Down the steps into the basement through the brown door of mystery is the first restaurant Shawn ever went to, ahem, twenty five years ago. Let's clarify that. Happy's is first restaurant Shawn ever went to of his own accord without a paying parent. He was only 19. But he felt like such a worldly grown up, moreso than he does twenty five years later. Happy's seems pretty much as he remembers it: a windowless basement with all the daggy old school red and gold Aussie Chinese restaurant trimmings, brown wooden panelling, red paper serviettes, and salt'n'pepper shakers on the tables. 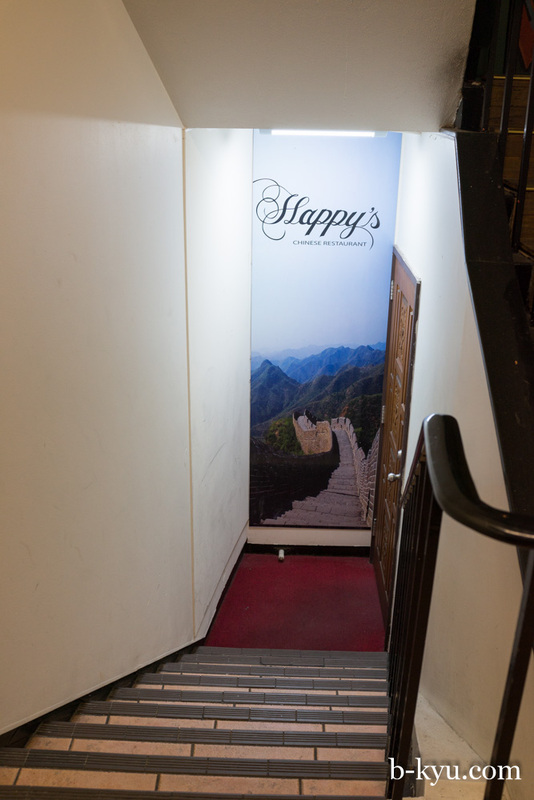 What seems new to Happy's is a buzzing cheery boozy Friday night crowd, there's almost a party atmosphere. 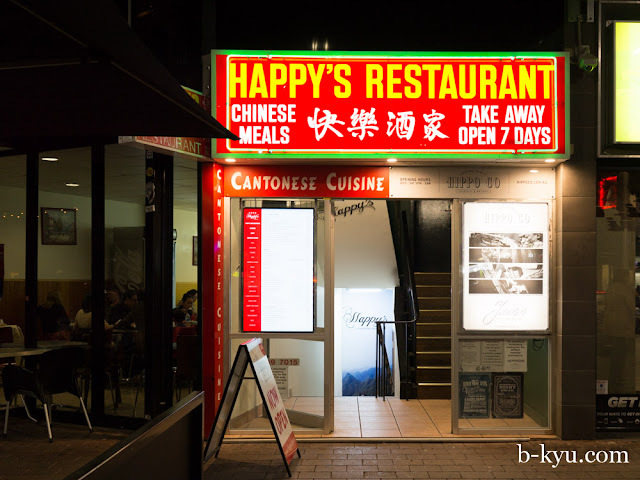 The folks that run Happy's have very wisely retained it's old school 'Choineese' restaurant vibe and cheered it up with fresh paint and mood lighting. You can dine both ironically and comfortably at the same time. The menu is surprisingly good too. 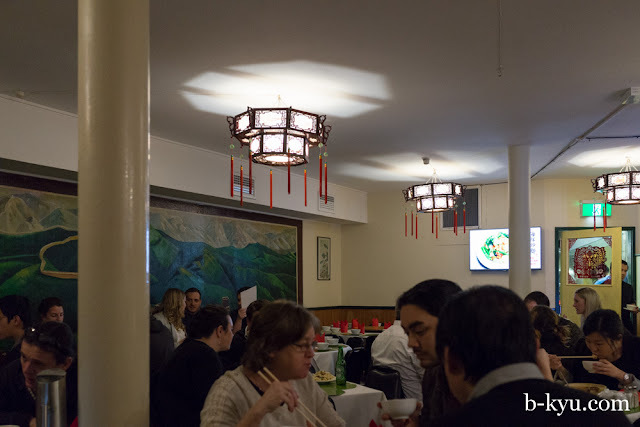 It has all your old school Aussie Chinese classics, but there's also a bunch of interesting, proper Chinese dishes as well. Which explains why there is actually Chinese folks eating in here. Yes, real live Asians: families, FABS, grinning tops old aunties and uncles. Geez, you don't visit a place for 25 years and it's all changed on you. We decide to order off the Chef's Suggestions. There's something glorious about perusing this section of a menu, you just never know what you might find. Often it will betray the true origins of the kitchen or some regional delights you wouldn't find elsewhere. It's a bit of a mystery flight food wise. We get a little fancier than normal and go for a seafood dish, Stuffed bean curd topped with seafood, $19.50. 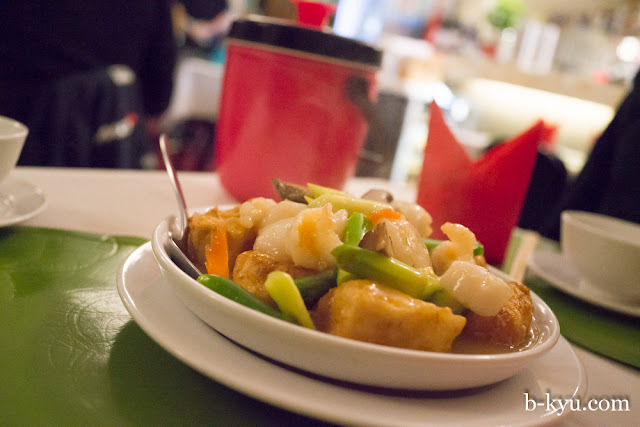 Cubes of tofu deep fried and then ladels of seafood and vegetables poured over. The sauce was a classic Cantonese shiny one, simple in design and easy on flavour. 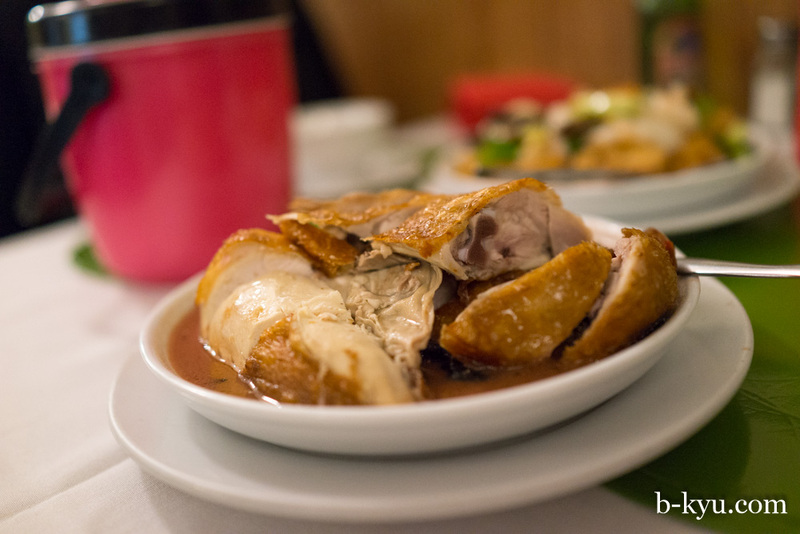 Roast chicken stuffed with preserved red bean curd sauce, $16.50. While the chicken was roasted it certainly wasn't stuffed, it was pretty good actually. However, the red bean curd sauce the pieces of chook rested on was a sensation. If you've never tried fermented red or white tofu in dishes then please go out and order it right now, or buy a bottle of each and experiment at home. These cubes of salty preserved tofu have the consistency of cheese, the pungency of really off cheese and the flavour of the most magnificent expensively wonderful cheese you could think of. They add a creaminess and fifth level flavour to a dish that is it's own. Happys's Chinese Restaurant is at 1/17 Garema Pl, Canberra. Phone (02) 6249 7015. www.happys.com.au. For more on Canberra's old school restaurants see this post on hercanberra.com.au. 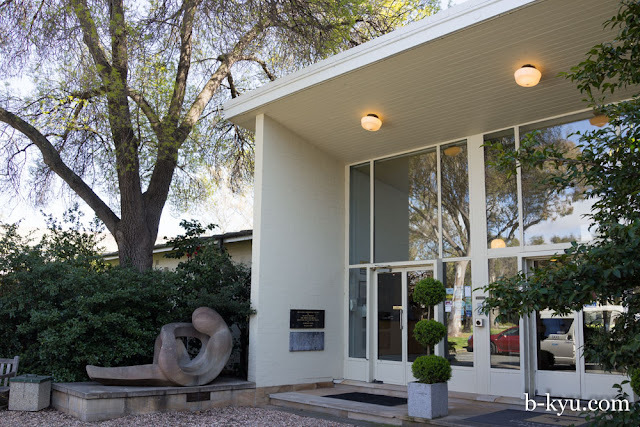 We had a bit of a retro theme to this Canberra trip, staying at University House amongst the trees and rah-rah of ANU. Love the curved walkway. 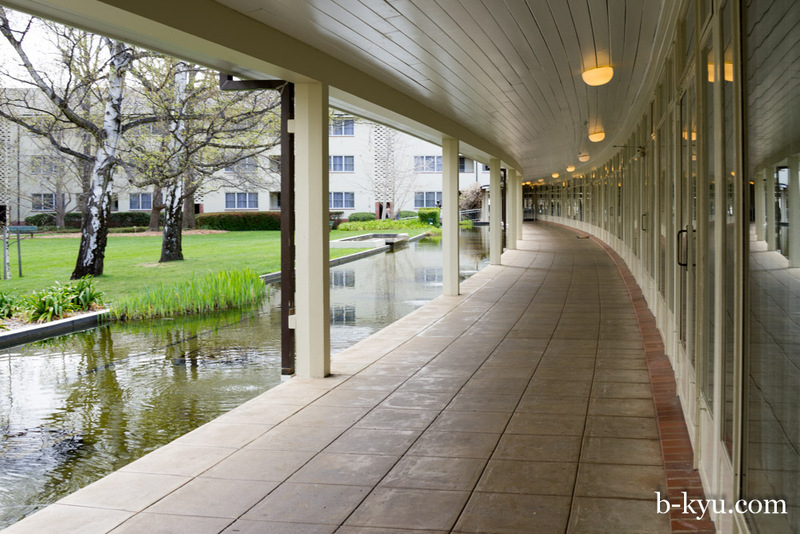 The whole complex was built in the 1950's and still retains many of the original features, including furniture and fittings. 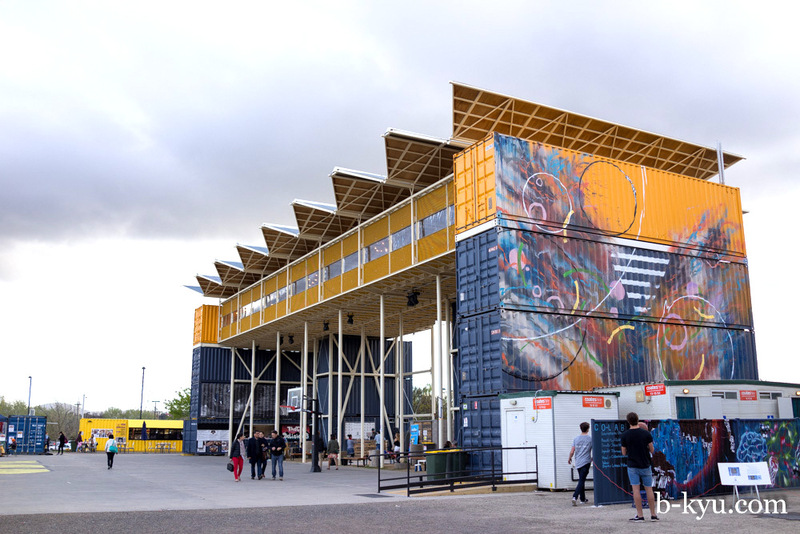 Just when we thought that Canberra wasn't the kind of city that throws in the odd random surprise, we stumble upon this multi-story structure made of shipping crates down around New Acton. There's a bar with a view of the lake up the top, perfect for summer sunset drinky-poos, and a bunch of food vans below. I think it is one in Dickson that they owned, Ruby's? Goodness me I'm older than you. I can remember when above this place was an excuse for a wine bar (very cosmopolitan in Canberra circa 1974), called the "Ides of Grape". What a great name for a bar in the world of political backstabbing!